I was engaged in a debate not too long ago about strategies to help develop Google Cloud Platform (GCP) skills around the world—I was making the case for more education, naturally—when my colleague asked me a blunt question: Miles, are you Google Cloud Certified? WHOA! I run the Google Cloud Solutions Architecture team globally. I’ve worked on cloud for a decade. I mean, I’ve got this stuff pretty well covered, right? “Well, no, I’m not certified,” I replied...but then I thought about it a bit more. Why should I get certified? Why should anybody get certified? The bottom line is: The rate of change in technology is accelerating. Sheesh, even the rate of acceleration is accelerating. (That’s called jerk, BTW.) There is so much value on the other side of those changes. Just think: What if the only tools at your office were a telegraph, an abacus, and a chalkboard? That said, new tools mean learning not only the tools themselves, but all of the surrounding changes those tools bring. Tech compounds! Everybody is affected by these changes. There’s just a huge amount to learn. Businesses building IT teams need to know who knows what, or they just won’t have the collective skills to take the next step forward. My team’s no different; I need to know my folks know cloud. But hold up, drop down flip it and reverse it: They need to know that I do too! Turns out, the awesome folks on our training and certification teams (with just a little help from a few solutions architects) have built these Google Cloud certifications to do just that. Suffice it to say, I can’t in good conscience say I’m in charge of Solutions Architecture for Google Cloud, and not pass our test, now can I? So I took the test, passed, and am now proudly Google Cloud Certified as a Professional Cloud Architect. But really, why get certified? Maybe you have this cloud thing down cold, but folks just don’t know it. Maybe you’re leading a cloud project and you want to make sure you’ve got the bases covered. Maybe you want to stand out from your peers. Maybe certification is the forcing function to get you ready for the next step in your career. Maybe certs are like Pokémon for you: gotta collect ‘em all. Whatever your reason for getting certified, you should just go do it. You could literally do it in the basement of your local mall like I did. Who knew there are smart folks taking tests right below the pretzel shop? Go to the certification website, and take a look at the details for your test. For the Professional Cloud Architect cert, you can find an exam guide with example case studies, a practice exam, and a list of recommended training. Those awesome Google Cloud training peeps also regularly promote free training resources. Through the end of the year, you can get one month of free access to Google Cloud training on Coursera. You can also get one month of free unlimited access to Qwiklabs—just enroll and get started with this series of labs designed to get you ready for certification (also good through the end of this year). 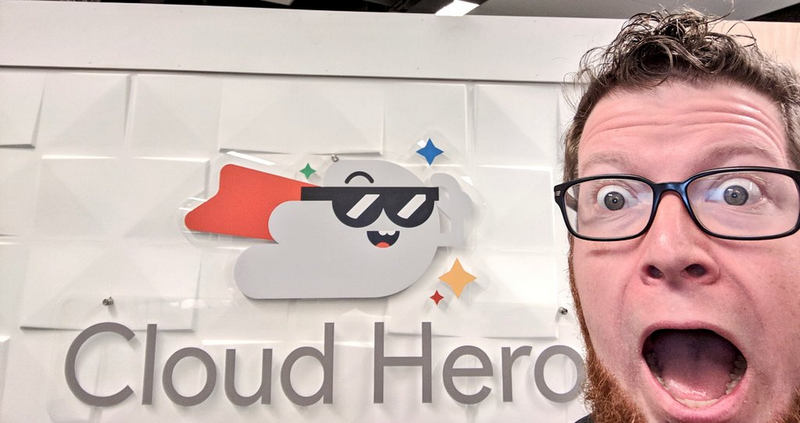 Or come play Cloud Hero at one of our Cloud Summit events around the world! I found the use of case studies throughout the exam to be super useful; they really ground the questions in a far broader background. So you can’t skimp. You gotta read all the way through to make sure you understand the nuanced details that absolutely make the difference between pass and fail. I marked a few questions for review, and upon a careful second look, WHOOO, I had almost missed critical bits. Details matter in cloud, folks! So now that I’m certified, I’d like to help others the way my colleague Rochana helped me (or maybe this “help” is more like “exact sweet, sweet revenge”). I challenge the readers of this blog, along with my illustrious peer Aashima Gupta from our Healthcare Solutions team, the ever-clever Anthony Vultaggio from our partner Smartronix, and my friend Nic Harteau from Eng to get Google Cloud Certified. Here's the deal. I've got two more fine folks to go, and then BOOM, that's my whole team certified. You ready to do the same? That would be brutal, y’all; it’s time to step on the gas! Go ahead, do it. Register for an exam and let’s all get ready for what’s next.